Before buying a new door for your house you should take some factors into consideration. Factors such as door style, colours, material, the way of hanging, sliding or swinging. Luckily, in Australia, we can pick a door in our taste without worrying about the door sizes. The door manufacturing industry has standardised the sizes for exterior and interior doors. Different types of doors have different standard height and width size. There is a difference of interior and exterior doors, as well as doors built from different materials, can have a different standard in sizes. 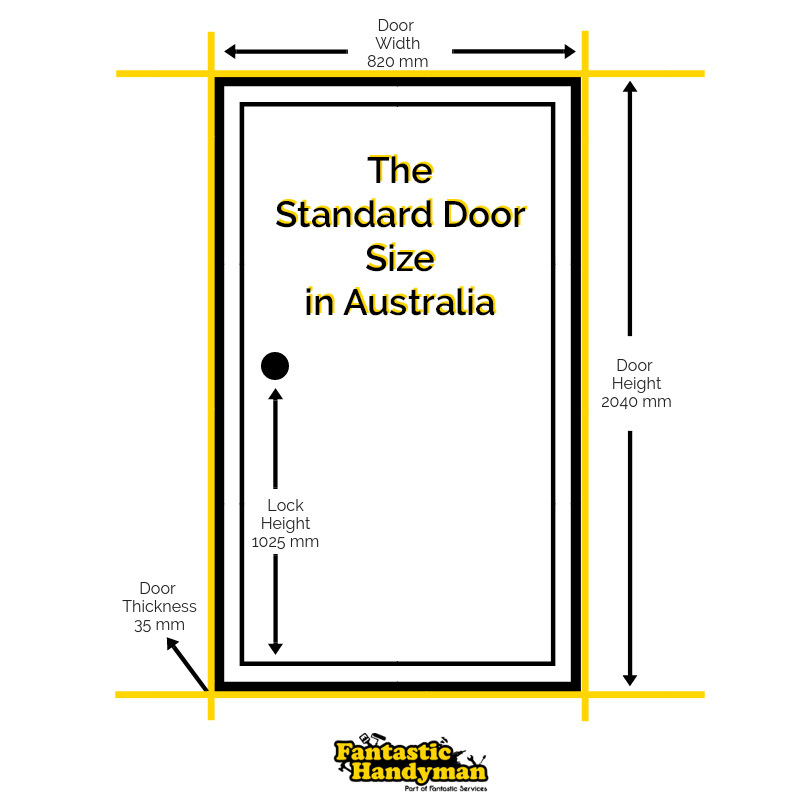 In Australia, the standard door size is 2040 x 820 mm x 35 mm. The standard height of doors is 2040 mm. A lot of new homes are built with higher ceilings and some of the doors are higher than the standard – 2340 mm. The standard door width is 820 mm, but there are other popular sizes used: 720 mm,770 mm and 870 mm. The standard thickness of the door is 35 mm. Most of the door frames are designed to carry up to 40 mm thick doors. Doors, categorised outside the standard sizes are considered custom doors and will require a custom made framing and hanging and may need to be modified to fit the space. Some of the factors that require installing a custom-made door are for disability access, aesthetic look or space issue. In Australia, the sizes of exterior doors are standardized, to help homeowners control their costs when building or renovating a property. The standard exterior frames are designed to hold doors 2040mm high and 820, 870, 920 or 1020 mm wide. Door manufacturers in Australia are producing doors in standard sizes to give the opportunity to its customers to choose doors in a variety of colours and materials without worrying if the door they like will fit the door frame or not. Interior doors are smaller than exterior ones. The height for all interior doors must be minimum 2040mm and the standard width for interior doors is 620, 720, 770, 820, 870 or 920 mm. The standard thickness for interior doors is 40 mm. When planning renovation or building a new door, have this measures in mind. The advantage of interior doors is that they’re easier to install and you can modify the door frame according to your preferred door size. This is more difficult to be done with exterior door frames. Panel doors have a standard size for interior doors. The height is 2040 mm, width 620 mm, 720 mm, 770 mm, 820 mm, 870 mm, or 920 mm and thickness of 4o mm. Panel doors are the most common choice when it comes to interior doors. Usually, they are made from wood and can be incorporated perfectly in almost every interior design in any property. Panel doors have a hollow core which reduces the used material required for building a door which reduces the cost of it. The standard size of flush doors is: height 2040 mm or 2340 mm, width 420 mm, 460 mm, 520 mm, 620 mm, 720 mm, 770 mm, 820 mm. 870 mm, 920 mm, or 1020 mm, thickness 35 mm. Flush doors are made of sleek skin and are usually wooden. They are the most affordable interior doors available. They give finish touch to any modern decor and interior design. The surface of the door can be painted in different colours to align with the colour scheme of the room. You don’t have to change the door if you decide to renovate a room, you can simply repaint it. The standard height of a bifold door is 2040 mm. As for the standard width, it depends on the number of panels the door has. For 2 panels the width is 1800 mm, for 3 – 2700 mm, for 4 – 3500 mm, for 5 – 4400 mm, for 6 – 5300 mm and for 7 – 6065 mm. The standard door thickness is 35 mm. Bifold doors are folding doors which open by folding back in panels. and are used in smaller rooms to save space. If the door frame is placed inconveniently in the room corner and doesn’t allow you to install a swinging door, the bifold door is the best solution for it. This type of doors is more expensive because of its complex production and installation. Glass doors are available in many different sizes. The standard height is 2040 mm. The standard width are 520, 620, 720, 770, 820 or 870 mm. Interior and exterior glass doors are becoming more popular in the modern decor in Australia. People opt for this type of doors to add a shine in their homes. They let more natural light in the property and make any room visually bigger. Interior glass doors are usually made by single or multiple glass panels held together by a wooden frame. They can be a folding or swinging type. We can help you with your doors! You can book our door related services in Melbourne, Perth and Brisbane!